We provide all calculations, supporting data, clear tables and a narrative spelling out all steps in an easy to follow format, based on the parameters and information you supply. 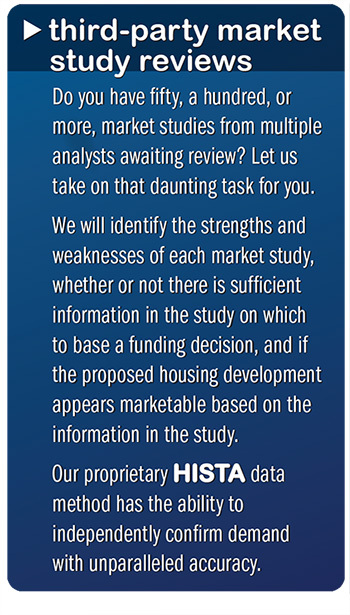 Our methodology for calculating demand is designed to include only those households with a reasonable likelihood of moving to a particular project. We strive to use only the households that can or would realistically live at a property so as not to over inflate demand. We calculate the households that fit within the income ranges for their specific household size. We recommend using age groups that local market data indicates have the greatest potential to live at a the type of community planned. We recognize the additional challenges of calculating demand from senior households and use only those with a reasonable propensity to move to a specific property.